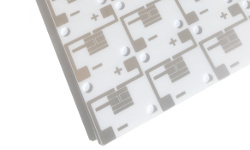 Our Printed Circuit Boards (PCB) plants have more than 10 years experience serving customers from a variety of manufacturing industries including Automotive, Industrial Control, Medical Devices, and Telecommunication. Using 2 manufacturing plants located in China and Taiwan with a total employee count over 1,000 and can produce more than 75,000 m2 of PCBs per month. Thanks to our strong technical support team we are able to back your entire project. 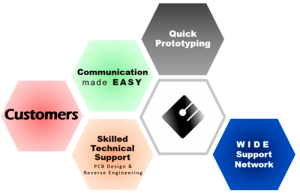 Wheter you need build-to-print or complete design services, Elite Advanced Technologies is your electronics partner. If case there is a need for a one stop solution including assembly, we can facilitate this request in cooperation with partner Electronic Manufacturing Solution companies (EMS) specialized in PCBA and box-build assembly. Contact us for more information. All our PCBs are tested, inspected and guaranteed. Both electrically as well as visually. We produce high precision double-sided and multi-layers (4 to 20 layers) FR4 boards, high frequency (HF) boards, heavy copper and ceramic boards. Rigid PCB (FR4). More info here. Ceramic PCB. More info here. We deliver directly and indirectly to a wide variety of global OEM’s and well known brands. Lead time starts after the final, approved, design has been received. 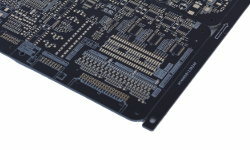 We can design or assist in your PCB based on electrical schematic. Please contact us for a quote. note: preliminary budget quotes based on minimal information are possible yet we do request a design (gerber) for a 100% accurate quotation. You can also use the contact form at the bottom or go to the contact page.